Here's Ian hot-gluing Curtis's "Horns"pre thumb smash. "That's what we call what you're feeling my dear: Tabanaca. It's Carnival Blues." I do have Tabanca!...Or feel Tabanca? Or am Tabanca-ish? How could I not have Carnival Blues? Dang it, after weeks of planning, collecting, gluing, beading and feathering. . .
Ian, Charisse & Curtis during a "Bead & Feather" session. Followed by weeks of playing and limin' and chippin' and whinin' bhoy--not that I am much of a whiner (the Trini kind anyway)--Post-Carnival, rather than coming as a welcome relief after way too much revelry, hit me with, as my mother likes to say, "A dull thud!" Tabanca. I tried getting busy. Still Tabanca. I tried ignore in it. More Tabanca. I'm tired of wallowing it in. So now I've decided to go with it. 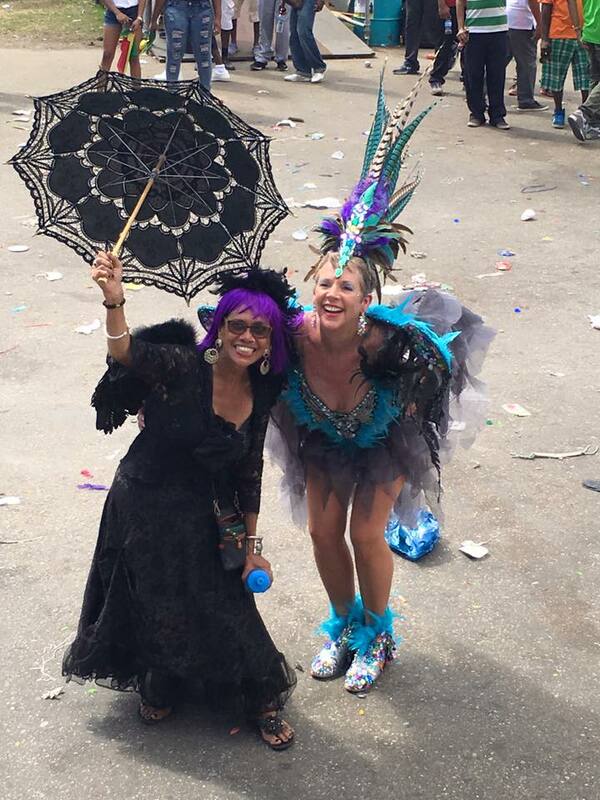 In a veiled effort to vanquish Tabanca, I decided to relive Trinidad Carnival 2016 by sharing memories here. Enjoy! 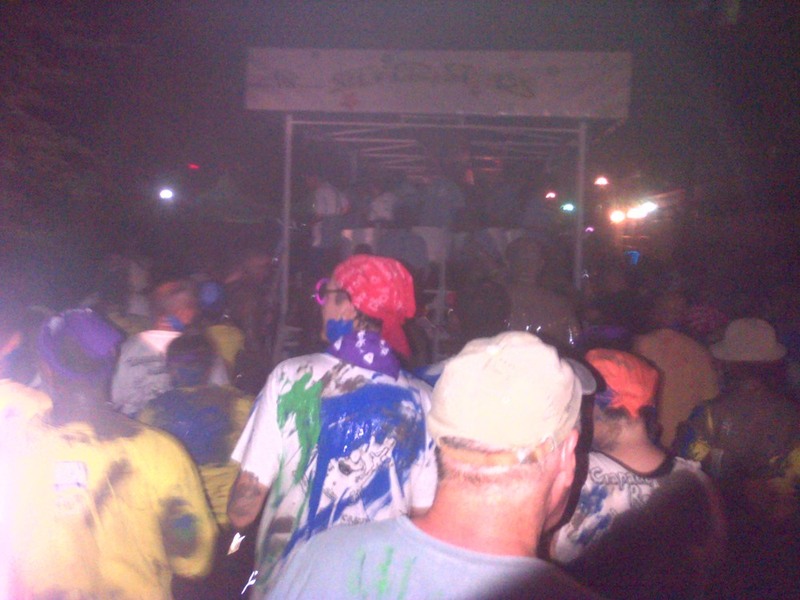 Jouvert 2015, we played with a band called "Cocoa Devils" and by the end of the night were smeared with cocoa "mud"
Carnival Weekend starts Sunday night, well really Monday morning about 3:00 am with Jouvert. 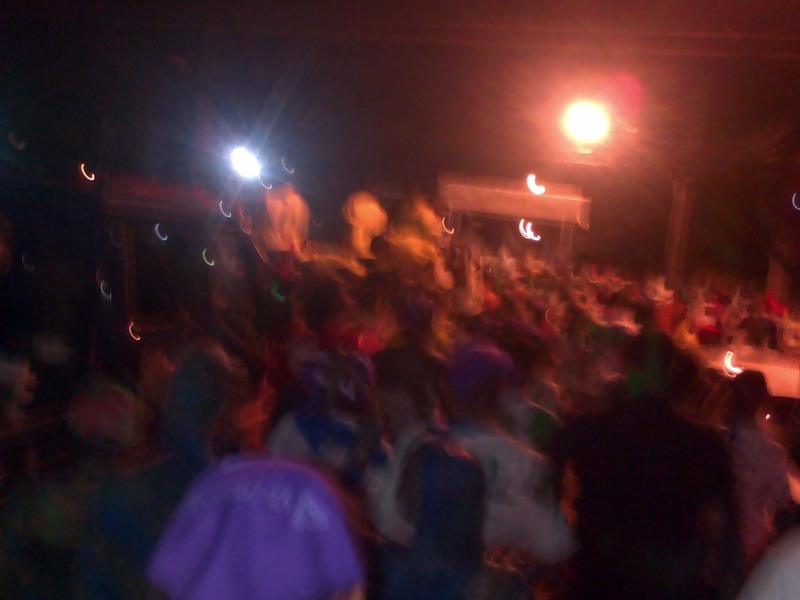 Revelers dance along beside music trucks--Steel Pan and/or DJ's spinning Carnival Music. Splashing, smearing, dunking in paint, mud (cocoa powder), and clay until after daybreak. In case you wonder where I'm getting my info, I've been reading up on it in John Cowley's Carnival Canboulay and Calypso. 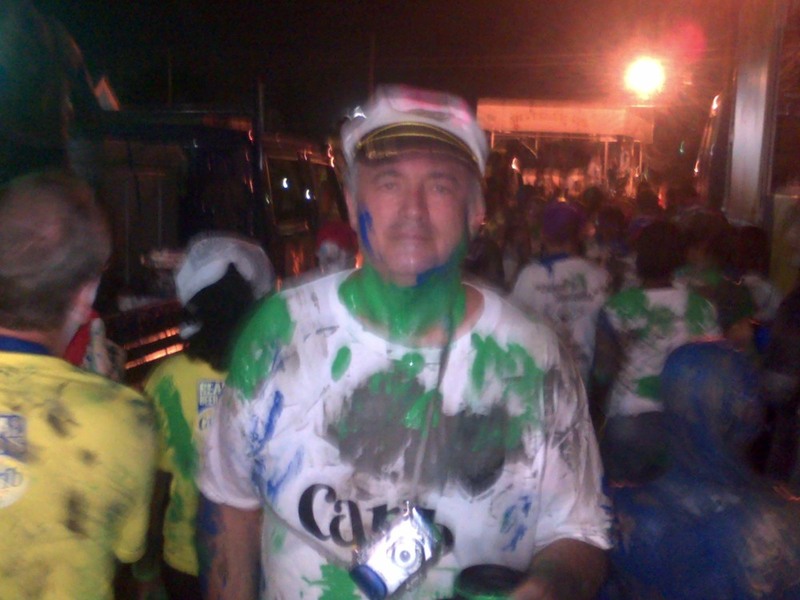 Like Jouvert, Trinidad Carnival's has ebbed and flowed. Carnival came to Trinidad in the 1780s along with French planters and their slaves from other Caribbean Islands. In the beginning the celebration went from Christmas right up to Ash Wednesday services. In wasn't until after 1797, when the British "Captured" Trinidad that serious issues and ordinances against Carnival began cropping up. Carnival Monday everyone dresses in part of their costumes and parade down the street. Carnival Monday costumes: halos, purple wig and comfy shoes. 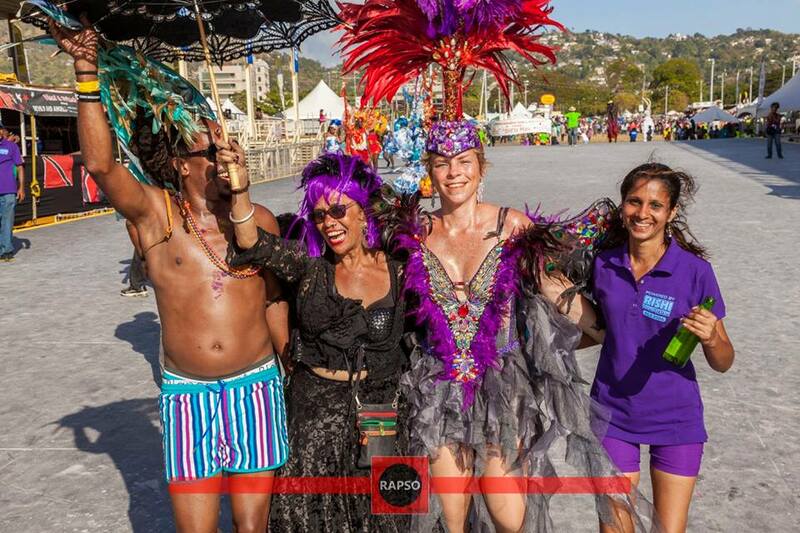 Carnival Tuesday is the culmination of "Bacchanal Week" with steel pan band competitions, King and Queen engulfed by costumes as big as floats--some fully 30 ft high x 30 ft wide--Kiddie Carnival, Band Camp "practice" sessions and parties "Fetes" to support the bands everywhere. 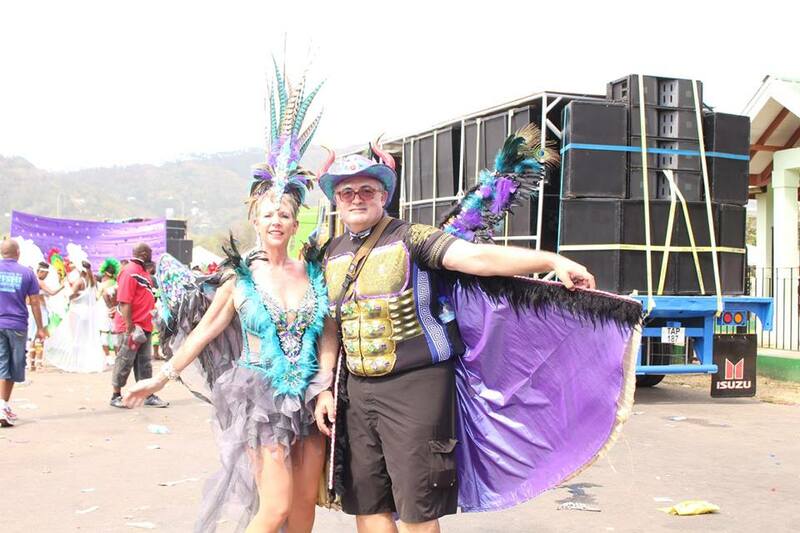 Here's a fantastic link to more about Trinidad's Carnival. And alas, instead of quenching my Tabanca, it's made me long for more...next year! The key to keeping mentally open and vibrant is having friends of all ages, the article expounded. It stressed that we should actively—purposefully—seek interaction with people of both genders from each decade. That doing so exposes us to new ideas, new music, new fads, new mores and conversely to old ones. In case you’re doing as I did, mentally slotting friends & family into decades, go back and put question marks by “Family.” Do our interactions with children, grandchildren and parents counts? YES…and NO. Yes, culturally, family members will and do expose us to so much we wouldn’t know about otherwise. But as for interacting with them as “friends. That depends. . . .
"Ok so we'd had a few drinks and we weren't wearing seatbelts when..."
"OMG, Dylan! That mother of yours..."
Knowing this truth—befriending people of all decades is good for you—and doing this are, like many things that are “good for us”: not necessarily easy. Shortly after learning this secret of youth, I shared it with a friend who’d recently moved to L.A. Ironically, the friend who was a decade and more older, physically recoiled at the idea. “Young people don’t want anything to do with me,” he argued. Knowing my friend took photography classes—at UCLA and the Art Institute, not the Senior Center—I pushed him on the point. My children’s writing community includes people of reading age up, literally. 10-20-30-40…70, 80, beyond united by virtue of being writers. Years fall away while we strive for similar goals. That common thread initially brings us together, from there other connections form. Surely the photography community was much the same? “Don’t you discuss photography things with the other students?” I pressed. He did; they did. “So why can’t you try to extend the friendship? Ask them for coffee or drinks, to an exhibit…” He scoffed. Water and time have passed since that conversation. I’m older. I’m more isolated. I’ve moved often and far, and my writing community has shrunk. My community while global is puny, too. Frankly, the family and friends I have keep me so busy, I didn't even realize it was happening. That decades of people, are rising up with whom I have no contact. To be honest, I hadn't missed that interaction with new, younger, older, different-- people--Or realized I missed it. And, I must confess, like my friend, as I've gotten older, I've perhaps become a little, if not fearful, definitely lazy about reaching out. Reaching out, making new connections, learning new--older, younger, different languages--takes energy. Perhaps way more than sticking with the familiar. And it's easy to let ourselves think we're doing just fine, why stir things up? Decades apart, but so much the same, I totally got what he was saying. Reaching out, making new connections, learning new--older, younger, different languages--takes energy. Perhaps way more than sticking with the familiar. And it's easy to let ourselves think we're doing just fine, why stir things up? I hadn't realized how much "stirring things up" and doing the "getting to know you" stuff mattered, and how much I've been missing it, until recently. . . Earlier this month, at my sis-in-law, Marilyn Bennett’s invitation, I joined her for a week’s retreat on Sanibel Island. (Marilyn's an author, writing coach, video-biographer, documentary filmmaker, check it out at Truth in Progress). Marilyn and me my Ist morning on Sanibel, the view from "Beach Baby's" lanai. Speaking of ride: here's Marilyn trying out the beach cruiser. Clueless as to who our hosts were—beyond knowing they were retired—or what, if any interaction, I’d have with them, I was truly, along for the ride. My first day on Sanibel, Marilyn and I joined our hosts, Deborah and John, for dinner at Trader’s Restaurant. Marilyn and I arrived first, purposefully early. I don’t know about Marilyn, but I was What if they don’t like me? What If I don’t like them? What the heck are we going to talk about? Nervous! “Buck up,” I told myself, as I ordered a martini “Up, dirty, large, extra olives.” Drinks and dinner—one evening—we can all make it through one evening. Deborah & John taking a spin! Conversation floated and flitted From one topic to another, as “friend” chats do, with nary an awkward silence. Birth year-wise, we were 3 maybe 4 decades; conversationally speaking we were contemporaries—interested, interesting, and challenging. United in a common goal! That 2nd sunset when the smoke alarms-all 4 of them-started chirping: "Silence Them!" Each evening’s topics were rich and varied. Deborah and John's personal histories broadened what Marilyn and I knew of the recent past. May be we taught them some, too. Decade to decade commonalities were never so pronounced as the night Deborah and John treated us to “So Good for the Soul”, a tribute to Mo-Town music at Sanibel’s Cultural Center, Big Arts. It was standing-room only in the theater. And Decade-schecade, it was OUR music! Truth is, if fate—and Carolyn—had not intervened, none of us (even if we were sharing the same sundown) probably would have made an effort to get to know each other. But we did and I, for one, am richer for it. Be the one to take that first step—or leap—across those great age divides. The fountain might be on the other side. Marvelous the way memory works. I think of mine like a Ferris Wheel*. When the music starts, the squeaky wheel spins for a while, slows to a stop, the door on the little cage closest to the ground swings open to let someone--or some memory--out, the door closes, the wheel starts spinning, that cage swings up out of reach, another cage swings to a stop. I know what's in the cages on either side. I can almost reach them . . . almost. As for those cages way up at the top? If I squint hard, I can see them. But danged if I know what's in them . . . The door swung open to a long ago Christmas Eve when in a panic, I pulled off the highway to call Ronnie because I'd forgotten the menorah. I'd called from a gas station pay phone because we didn't' have cell phone back then. Rosie (as we called Lexi back then) and Max (ever Max) were especially excited because that year Hanukkah and Christmas Eve were on the same day, so we NEEDED a menorah! With the last name of Goldman, everyone but the few acquainted with the prominent "Catholic Goldmans" of Tulsa, assumed we were Jewish, and I, a non-practicing anything, with two half-Jewish as possible--considering the Jewish half was not their mother's half--children was committed to upholding all traditions. Fortunately, my dear friend and writing partner, Ronnie, a full-blood Jewess and, as it happens the first women in Oklahoma to have a Bat Mitzvah. In addition to baking & decorating the best Hanukkah sugar cookies, was educated enough for both of us. "You can use a potato!" Ronnie told me. She went on to explain how during the Holocaust, because Jews were not allowed to keep traditions, were, in truth, imprisoned or killed if any religious accouterments were discovered in their possession, they improvised: thus the Dreidel game, a secret way to study the Torah; the common potato, a secret menorah. We stopped at a grocery story before we stopped for the night. And that night and for the following seven nights, light our potato menorah, said prayers, and opened gifts. This photo is not mine, but this is including the birthday candles--sans the gold paint--what our menorah looked like. Up up up to the stars . . . And on the way, nudged my Ferris Wheel. The power of words: it takes so few to coax down a distant cage. *Wait! Before the music plays and the wheel spins again: Be sure to check out Dani Sneed's book, THE MAN WHO INVENTED THE FERRIS WHEEL. about George Ferris and his World's Fair Wonder! You and every kid you know will be glad you did. Mama has a brand new bag: she's a CA Chromaniac! In anticipation of the Belmont Stakes, Mom sent a packet of newspaper clipping of California Chrome along with a check and instructions to "Bet it to Win!" 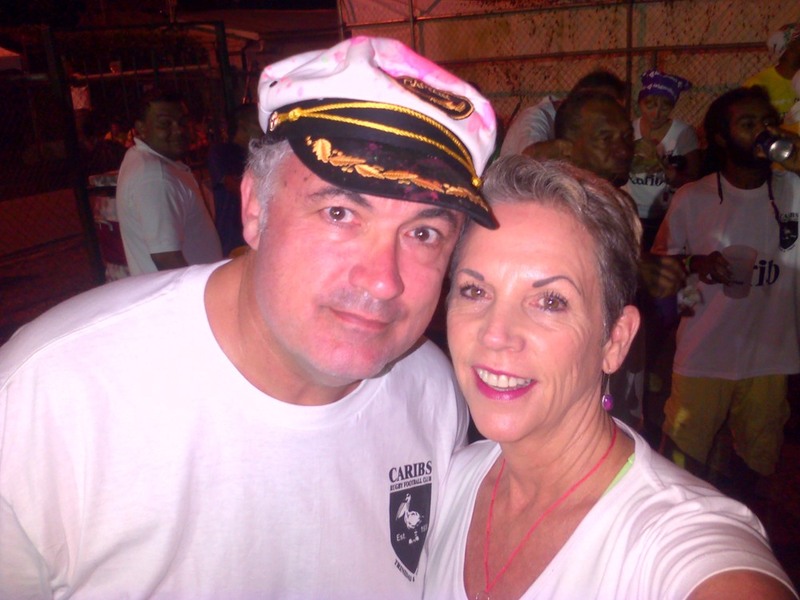 Truth is, Curtis & I started this latest of Mom's obsessions by attending Kentucky Derby weekend 2014.
Who knew, when we donned our fancy hats and duds that was the beginning of CA Chromania! Look, Mom! I placed the bet! Since 1931, the order of Triple Crown races has been the Kentucky Derby first, followed by the Preakness Stakes, and then the Belmont Stakes. . . Mom's betting that after today's race, I'll be able to name another: California Chrome! The Kentucky Derby is all about tradition. 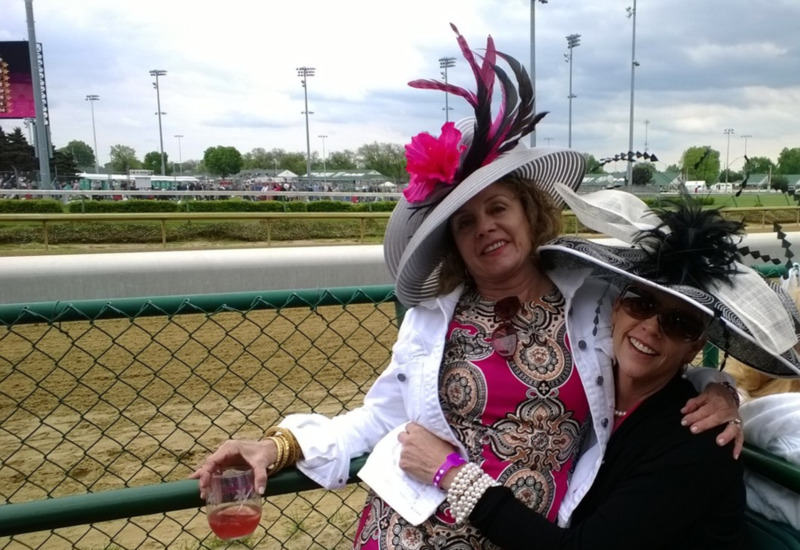 We were especially fortunate to be guided through our first Derby weekend experience by veterans, Joy & Donna, both Louisville natives whose Derby history stretches back 30 plus years. Michael led the way into Churchill Downs . . . Note the gallon ziplock bags Michael is carrying! There are rows of booths selling all manor of food on both race days, but locals traditionally bring in their own. Joy and Donna's specialty, and a Derby tradition: sandwiches with a cucumber-cream cheese spread called Benedictine. Donna stopped to pose with a a pair Pinked up for The Oaks--her personal tradition! The Oaks is run the Friday before the Derby. As Derby Day has attracted more "tourists" and become more expensive, locals prefer The Oaks. Our box for Derby Day was right at the finish line. Before races, attendees gather at the stables to check out the horses. "The Derby" is really 2 days of racing. The Oaks is held on Derby Friday; the Kentucky Derby on Saturday. “The Oaks,” so they say, has gained in popularity with locals as The Derby has become more commercial and more expensive. Too, “The Oaks” is a fundraising event, for Breast Cancer research and awareness and most folks dress in pink. A portion of the sale of each Pink Lily goes to charity: Bright Pink and Horses for Hope. We donated of course! No clue if/what Moet Chandon donated, but we supported that, too! Let's hope the Cigar proceeds were donated, too! Here's Aaron with Lee. Tradition and convenience demands they always park at the same place: Ms. Lee's house. Lee's made Derby Weekend a business. She turns her yard--front and back into a parking lot, and blocks off as many street spots as she can. She used to cook for both The Oaks and The Derby, but now Lee only cooks on Derby Day. Her specialty is greens, beans & ham. No matter what, Meet back at Lee's! 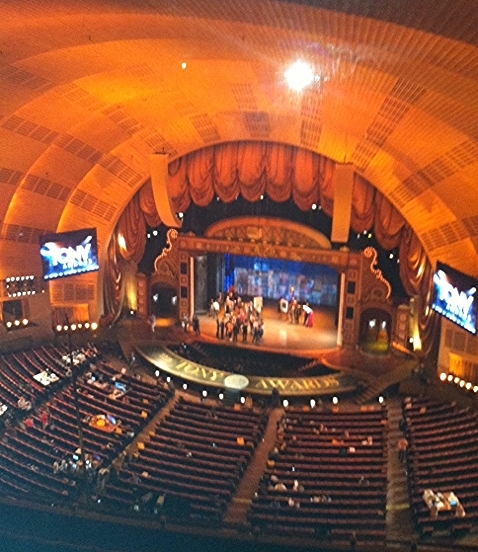 Almost time: At 6:52 EDST the Belmont Stakes starts. The horses are making their way to the starting gates. Mama's watching!